The UFC 123 main event between Quinton “Rampage” Jackson and Lyoto Machida on Nov. 20 at The Palace of Auburn Hills in Auburn Hills, Mich., re-opened the Pandora’s Box of issues and debates surrounding MMA’s scoring system. Jackson disowned his split decision win over Machida, who blitzed him with offense in the third round. Jackson’s response drew a rebuke from UFC President Dana White for ceding a fight that could be rightfully judged in his favor, per the letter of the rules. There was no debate to be had in the co-main event, though, as B.J. Penn re-ignited a welterweight title campaign with a memorable knockout of Matt Hughes to cap a rivalry framed as the greatest in UFC history. Round three of Rampage vs. Machida was highlighted by the once-beaten Black House fighter’s mount on Jackson, a position from which he worked for submissions. Machida achieved mount after he knocked down Jackson with a rush of punches. Jackson took the first two rounds in the judges’ eyes by coming forward and landing a greater volume of punches, raising questions about whether or not Machida’s evasive style costs him points despite protecting him from significant punishment. Machida admitted after the fight he might need to consider a more aggressive style. The bout also opened the discussion about whether fights between top contenders should be five rounds, regardless of whether or not a belt is on the line. With the win, Jackson knocked Machida from his perch as No. 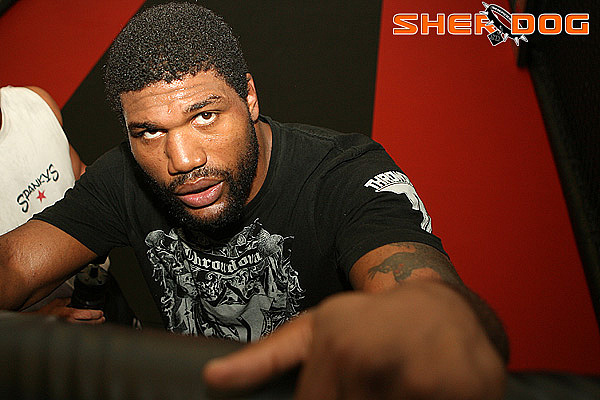 2 light heavyweight in Sherdog.com’s rankings. Jackson is now ranked third, Rashad Evans second. The loss also bumped Machida from Sherdog’s pound-for-pound rankings. In his post-fight interview, Jackson dismissed the decision, praised Machida and offered a rematch. White took the charismatic Jackson to task for negating the win, saying it was clear Rampage took the first two rounds and calling him “a nutball” in an interview with MMAJunkie.com. Two of three Sherdog.com judges gave the first round to Machida, with one draw; two of three judges saw the second round a draw. Machida landed leg kicks in the first and forced Jackson to miss on many of his biggest punches. The ambiguity came after one of the most decisive finishes of the year. Penn put forth one of his most galvanizing performances with an animalistic, 21-second knockout of Hughes in the rubber match between the two legends. The performance derailed the Hawaiian’s stated goal of returning to 155 pounds after the bout. Instead, Penn has been booked against top welterweight contender Jon Fitch for UFC 127 on Feb. 26 in Australia. Penn, 31, hinted he may look to close out his career at welterweight and retire at 35. • Penn was not the only fighter to lock in a date at UFC 127 in Australia as a result of his performance at UFC 123. George Sotiropoulos earned a spot at the event, in his homeland, by surviving a first-round rush from Joe Lauzon to calmly catch a kimura submission in the second. Sotiropoulos faces Dennis Siver at UFC 127. • Middleweight prospect Gerald Harris was cut from the promotion after losing to Maiquel Jose Falcao Goncalves via decision. After dropping two rounds to the aggressive Brazilian newcomer, Harris showed no urgency in the third, leading to a maddening stare-off. UFC matchmaker Joe Silva reportedly refused to enter the cage to shake the fighters’ hands after the fight, as is his custom. • Also thought to be released from the promotion was Karo Parisyan. The troubled welterweight was cut loose for the first time in 2009 after pulling out a fight the day before weigh-ins and battling issues with painkillers and panic attacks. Parisyan lost in 1:47 to Dennis Hallman via technical knockout. White, who vowed to never again book Parisyan after his UFC 106 withdrawal, told MMAFighting.com that Parisyan was likely done fighting in the UFC. • Others picking up wins at UFC 123 were Brian Foster (round-two guillotine submission over Matt Brown), Mark Munoz (unanimous decision over Aaron Simpson), Edson Mendes Barboza Jr. (third-round TKO over Mike Lullo), Paul Kelly (second-round TKO over T.J. O’Brien), and Nik Lentz (split decision over Tyson Griffin). The wins by Foster and Munoz aired live on Spike TV; Victories by Barboza and Kelly made the pay-per-view broadcast. • $80,000. Amount paid out for UFC 123 performance bonuses, awarded to Penn for “Knockout of the Night,” Davis for “Submission of the Night” and Sotiropolous and Lauzon for “Fight of the Night.” The amount was the second highest of 2010, after UFC 115, which paid out $85,000 bonuses. It was the fourth performance bonus for Lauzon in his last four fights. • 16,404. Announced attendance at The Palace of Auburn Hills in Auburn Hills, Mich. It was the first time the UFC had come to Michigan since UFC 9 in 1996, which was held in Detroit’s Cobo Hall, drawing an estimated 10,000 fans. • $2.1 million. Amount collected in gate receipts, the fifth-lowest of 15 numbered UFC events this year. • 1.5 million. Average viewers for the UFC 123 preliminary fights special on Spike TV, preceding the pay-per-view. It represents the same audience as most recent specials before UFC 121. • 33. Significant strikes landed by Machida on Jackson over three rounds, according to FightMetric.com. Rampage landed 16. • 70. Total strikes landed by Jackson in the fight, compared to Machida’s 53. • 1,500. Total fights in the UFC history books, with the conclusion of Foster vs. Brown. • 7. Seconds by which the early horn sounded, signaling the end of the first round between Harris and Goncalves; Goncalves had a rear-naked choke cinched at the time. Michigan’s athletic commission was reviewing the situation, but the fight result almost certainly would not be affected. • 7. Straight UFC wins for Sotiropoulos, the second-longest active winning streak at lightweight behind Gray Maynard, who has eight.